How to use WEBEX platform ? 'Cisco Webex' is similar to Google Hangouts and the online meeting will be loading through your web browser. You will be receiving a Webex Invitation after this email and please REGISTER in to the meeting by using the 'Register' link and follow the following instructions when you are going to connect with the meeting. This guide covers the basic functions you will use to attend a Meeting Center session from your Windows computer. Also included here are instructions for using the most common tools available during your sessions. 1. Open your invitation message, and then click the link to join the meeting. The Meeting Information page appears. 2. Under Join Meeting Now , enter your name, email address, and the meeting password. 3. Click Join Now. You are connected to the meeting. You can connect to the audio conference with a telephone, or with a computer through VoIP (Voice over Internet Protocol). After you join a meeting, click the audio panel to connect using the previous method you used, or click the dots (...) to display more choices. 2. Click Call Me. You will receive a call and may be prompted to press 1 to connect. 1. Dial the phone number listed, enter the meeting access code, and enter your attendee ID #. 1. Click Call Using Computer. You are connected to the audio conference. 2. Adjust your speaker and microphone settings as needed. The meeting window is similar to a conference room where people meet in person. This is also where the meeting is managed and material is shared. The menu items at the top of the page allow access to additional Meeting Center functions. Content Viewer: Displays presentations,documents, video files, whiteboards, and Web content. Panels: Provides areas for chat, polling, Q&A,names of participants, and the recorder. 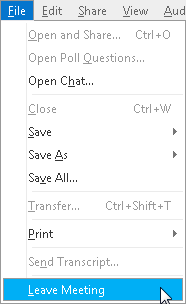 Menu Toolbar: Allows access to Meeting Center tools and functions. 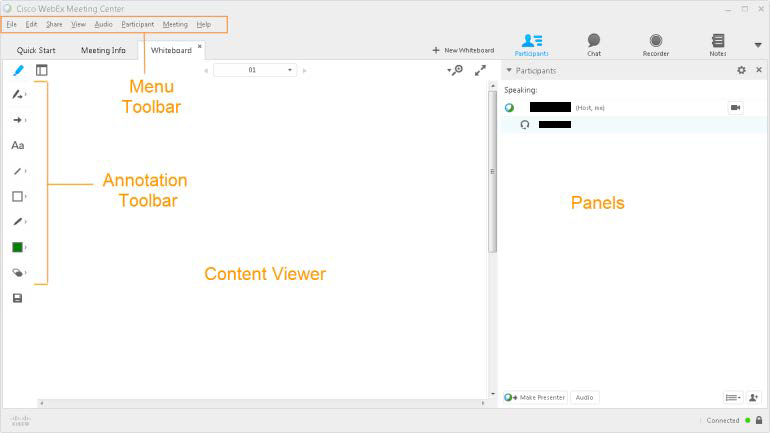 Annotation Toolbar: Lets participants annotate files and whiteboards shared during a meeting. Mute/unmute your audio. Best practice is to Mute yourself, if you are not speaking in the meeting. Participants can share and view their video during a meeting. If you enable the video that need extra bandwidth to provide quality video stream. 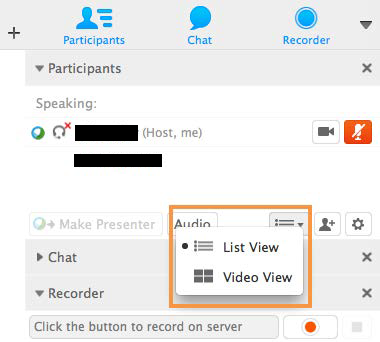 Click the camera icon in the Participants panel. The icon turns green, and your video feed appears at the top of the Participants panel. Click the camera icon again to stop your video. It is recommended to enable video if it is essential and not a disturbance to the meeting. You can control video settings, as well as switch between cameras connected to your computer, by clicking the Set Video Options icon beneath the Participants panel. To see the thumbnail images of other panelist, click the view icon, then select Video View. Attendees can leave a meeting at any time before it ends. Click Leave Meeting to confirm.